You gotta admit it, trout fishing gets into your soul. For me it started about the time I could hold my first Zebco kid’s rod and cast a salmon egg and a bobber. Some 50 years later, I’m still doing it and although I’m happy with any trout I catch, there’s nothing like hooking a nice brown. Once you learn where and how to get them, you’ll let the other folks have the planters. 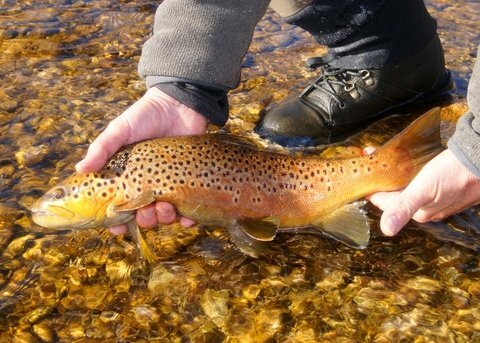 Brown trout are predators and are actually known to eat small mammals! Did that get your attention? So the first thing you should do is think like a predator. Browns are very fast and aggressive and are also very smart. If you think you’re gonna catch one on corn or marshmallows, think again. They can be challenging unless you know the tricks. I have had a great deal of luck using lures. The trick is to remember that you can retrieve a lot faster than normal because browns love the chase. The same goes for trolling. Browns typically cruise the shallows looking for food but they are easily spooked. If you’re fishing rivers or streams, be aggressive and sporadic in your retrieval but make sure to use cover. Lures and spinners that work well on rivers and streams include the Panther Martin (my favorite is the black with yellow dots, size 4), Blue Fox and Kastmaster. Make sure they have the trout pattern and are gold in color. You can experiment with different brands and as long as they look like small browns, you’ll probably find one that works. Trolling for browns is exciting and I have had a lot of luck over the years using a jointed Rapala with the same brown trout pattern. Troll close to shore and don’t be afraid to go faster than normal. This method has worked year after year for me at Lake Tahoe. Curiously though, this technique seems to be the opposite in the northeast. If you like trolling out of a small boat or kayak on lakes that don’t allow motors (my favorite lakes), try a frog patterned Flatfish and stick to low traffic areas. Most small lakes have an abundance of frogs and browns love them. I’ve also had better luck near shelves that drop off sharply. Brown trout can easily retreat into the depths for safety. Browns prefer warmer water in the spring and area also likely to be near the shore when the wind blows out of the east. If you’re tossing an arsenal of lures lakeside, make sure the wind is blowing in your face. The wind blows food into the shore area and typically muddies up the water. Browns can conceal themselves better and are less spooked. Try throwing a gold lure with a silver spinner—then hang on! One of the biggest browns I ever caught was at Boca Reservoir near Truckee California while still fishing from shore using a worm. I simply take an oval sinker (just heavy enough to keep from drifting) and run it up the line about two feet. Put a small split-shot to hold it from sliding toward the hook and put a number six hook on. Thread the worm through the clitellum (the thick ring) just enough to cover the hook. Let the rest hang and inflate the worm (worm blowers are cheap and can be found wherever you find worms). The sinker will sit on the bottom and your inflated worm will float two feet from the bottom, keeping it out of the weeds and away from the crawfish. Any of these techniques will usually work for browns. Aside from putting up a great fight (even the little guys), they are probably the tastiest trout you’ll ever eat. Unfortunately as good as they are on the stove, they also contain a high level of mercury. They taste so darn good though, most folks will take the chance, especially considering how challenging they are to catch.